A 2008 study by the non-profit organization The Education Commission of the States concludes that arts can play a critical role in improving the academic performance of students. In a national sample of 25,000 students, those students "with high levels of arts-learning experiences" earned higher grades and scored better on standardized tests than those with little or no involvement in the arts-regardless of socioeconomic status. Learning through the arts also appears to have significant effects on learning in other disciplines, with "students consistently involved in theaterand music showing higher levels of success in math and reading." Among eleven high school subjects, superintendents rank arts activities among the top four. Arts education makes a tremendous impact on the developmental growth of every child and has been proven to help level the "learning field" across socio-economic boundaries. Arts education has a measurable impact on at-risk youthin deterring delinquent behavior and truancy problems while also increasing overall academic performance among those youth engaged in after school and summer arts programs targeted toward delinquency prevention. 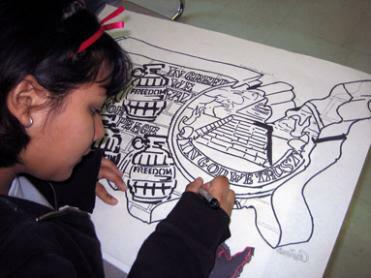 Arts education in schools increases test scores across every subject area, lowers drop out rates and helps close the achievement gap regardless of socio-economic status.